Autumn and Seyi had been admiring each other from afar. Both students at Fresno State, they would glance at each other and smile between classes and see one another at parties and sporting events. Finally it was Autumn who made the first move by sending Seyi a Facebook message. This started the romance rolling…. The two talked into the wee hours of the night and watched the sunrise on their first date. They were fascinated how similar their childhoods were and loved hearing about each other’s experiences of growing up. Since that night when they first locked eyes, they knew it was fate. It was very important to the couple to keep all the festivities in one location so that guests could enjoy the ceremony, cocktail hour, and reception without having to relocate. Casa Real (meaning “House of Royalty”) proved to be the perfect venue. It is truly a charming place surrounded by old wine vineyards and olive trees and filled with old-world style. 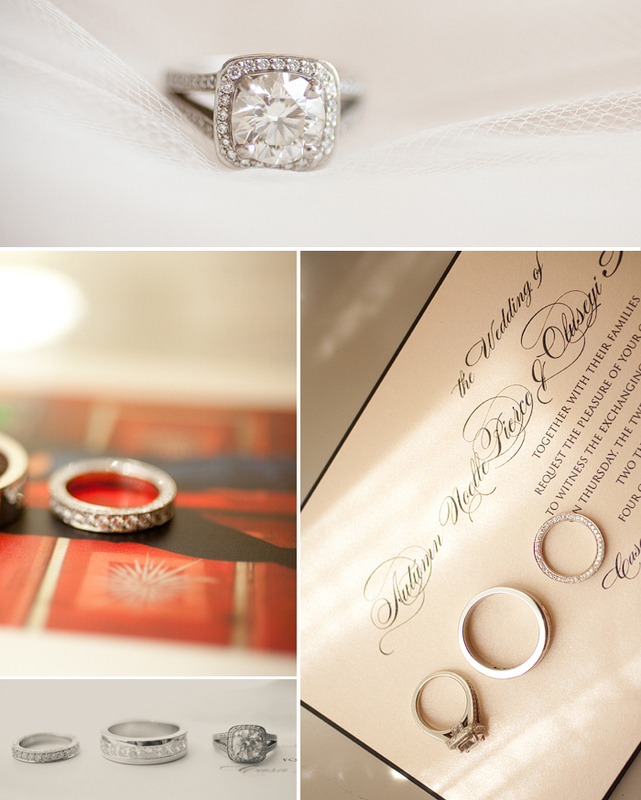 Autumn wanted a romantic, elegant, opulent, and regal wedding. The couple hired Debra Hiebèrt of Très Fabu Event Planning and Design to design and produce the wedding ceremony and reception celebration. During this time, Autumn was located in southern California and Seyi was in North Carolina. Autumn Googled “Fabulous Wedding Planner” and the rest is history! The wedding planning took about six months. Debra quickly referred Autumn to The White Dress boutique in Corona Del Mar, where she immediately connected and clicked with Brielle Steiner, Senior Bridal Stylist. Autumn chose a Lazaro Design wedding gown—a modified A-Line gown with a strapless sweetheart neckline, a chandelier beaded midriff, and a full skirt of tiered organza. 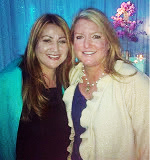 When designing the wedding and ceremony, Debra based all of the “bling factor” that Autumn had requested on the design of Autumn’s wedding gown (for the wedding cake, the wedding cake table, and the head bridal party table). Autumn and Seyi were married inside the intimate and romantic Amber Room, a truly warm setting with golden brown walls, porcelain tiles, and candlelight. 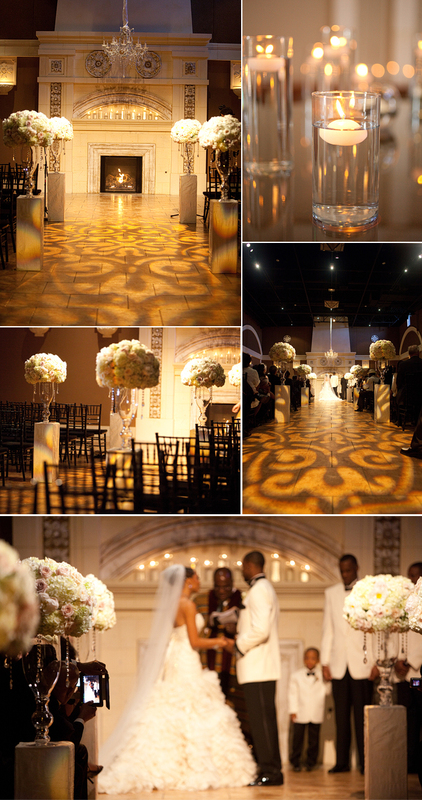 Très Fabu Events brought in one large and grand chandelier and arranged for a pre-lit custom designed aisle runner. Friends and family gathered from all over (about 260 guests) to attend the black tie affair. 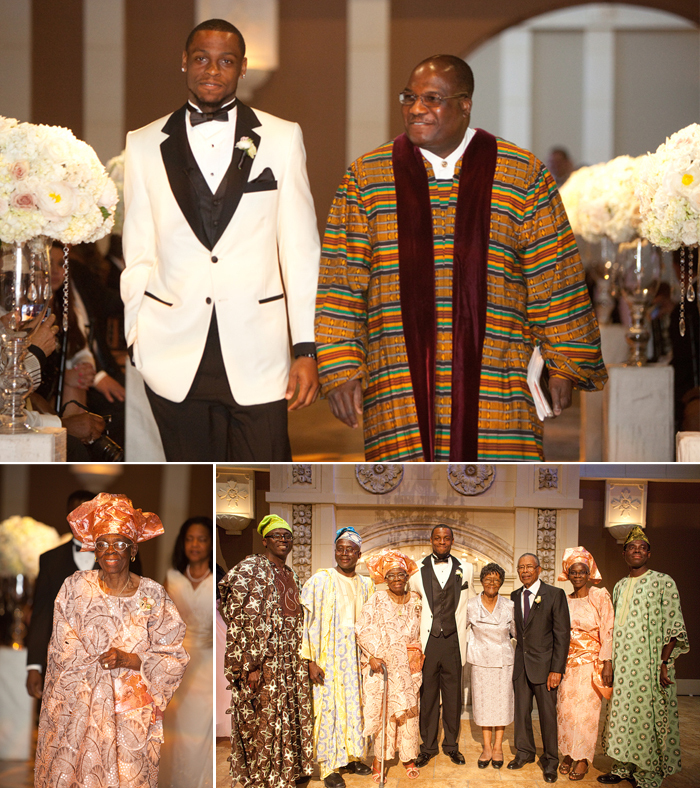 The ceremony was performed by Seyi’s Uncle Olu Ajirotutu. He is originally from Africa and Seyi’s grandparents and some family members traveled all the way from there as well. 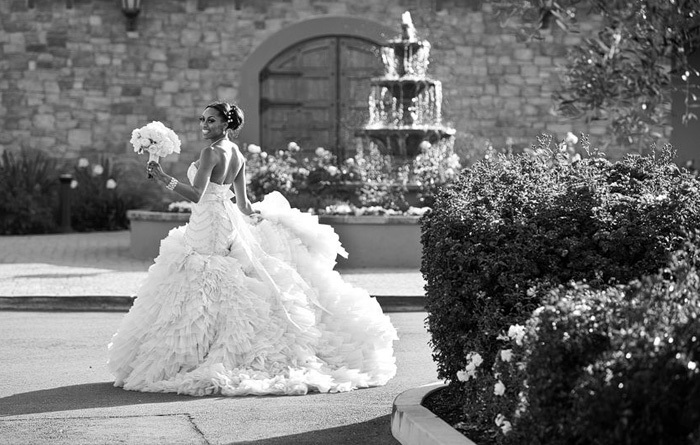 The couple included a “Jumping the Broom” ceremony (a deep rooted African-American wedding tradition symbolizing “sweeping away the old and welcoming the new”). As Autumn and Seyi shared their vows, standing in front of a 12-foot, hand-carved limestone fireplace, and underneath the grand Austrian crystal chandelier, they were smiling from ear to ear. Guests enjoyed the cocktail hour following the ceremony, where passed appetizers included sushi, tomato soup with grilled cheese wedges, sliders, and french fries. 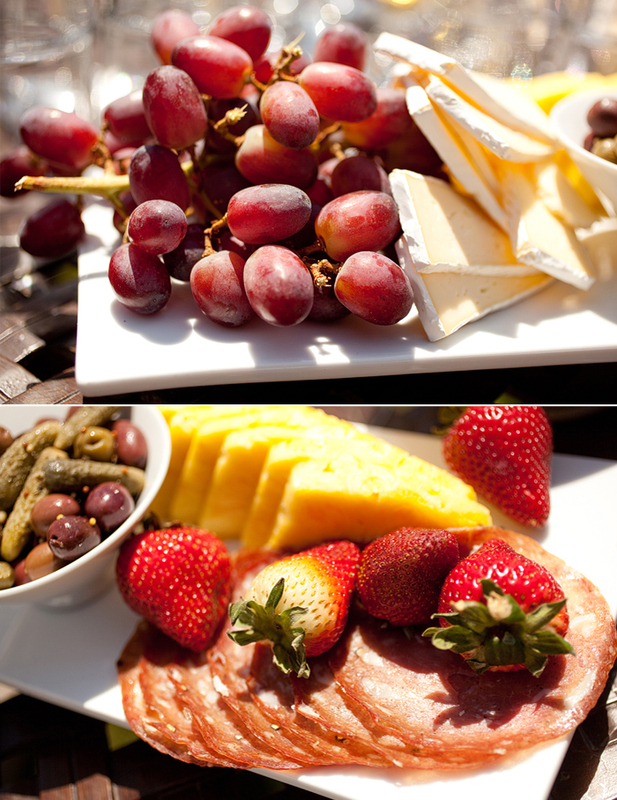 An appetizer table included: imported and domestic cheeses, artichoke dip, salami, Peppadew peppers, salted Napa almonds, Spanish meatballs, and fresh fruit. As the newlyweds and their guests made their entrance down the “red carpet” for the paparazzi experience (by Brandon Edward), the evening celebrations began! 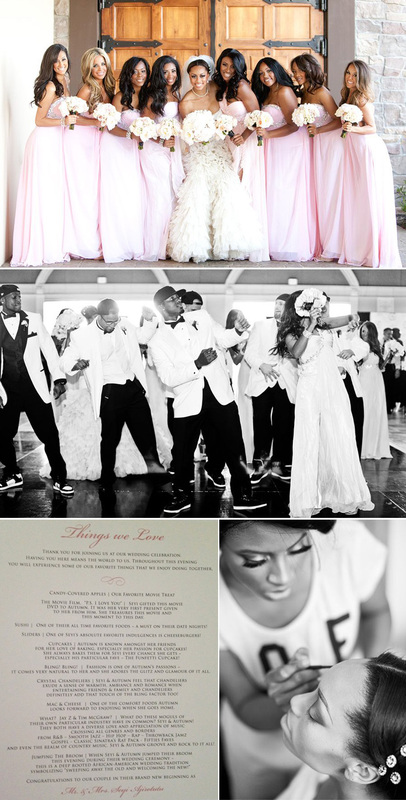 Très Fabu Events incorporated the colors of the day (ivory, blush pink, and black) throughout the reception décor. The bridal party head table was dressed in black satin rosette linens with pink showing in napkins and the head table chairs slip caps. Guest tables were a blush pink in shantung raw silk with a black silk napkin. Soft pink, amber, and white up-lighting was used throughout the reception space. Florals included: hydrangeas; Ecuadorian roses in white and ivory; and hints of white O’hara garden roses and beautiful peonies. Autumn’s bouquet was made of all white peonies with white ranunculus, spray majolica white roses, and white sweet peas. “Debra’s [Très Fabu Events] attention to details and incredible energy were absolutely contagious,” says floral designer Nicole Ha. Guests loved the delicious entrees prepared by Ruby Hill: achiote-marinated tri-tip with dried pasilla demi and queso fresco; salmon garnished with vine-ripened tomato and cucumber salad; garlic-herb cheese stuffed chicken with lemon-thyme butter sauce; stuffed porto bellini mushroom with caramelized sweet onions and thyme; and macaroni and cheese served family style. For dessert, not only were they treated to wedding cake and cupcakes, but candy covered apples too! 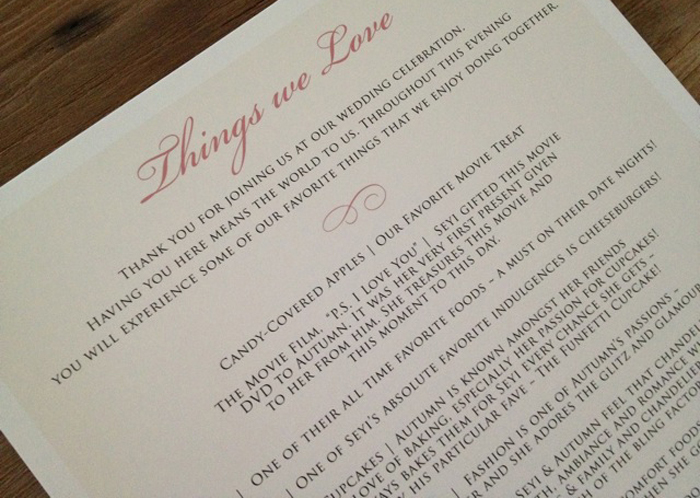 Music from all genres played during the reception, as the couple has a diverse love and appreciation of all types. 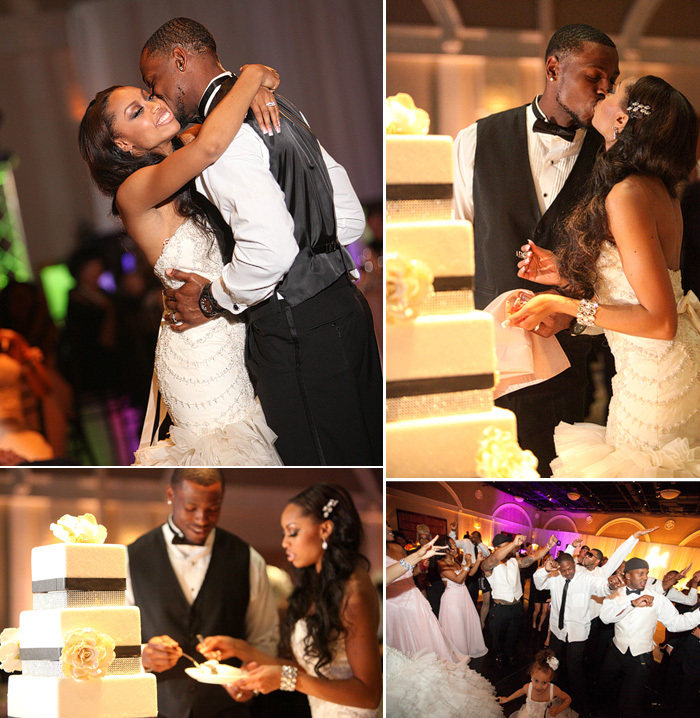 Autumn and Seyi shared a first dance to “Endless Love” by Mariah Carey and Luther Vandross. The very professional and upbeat staff at Casa Real/Ruby Hill played a major role in the success of the day…a FABULOUS time was had by all! Debra, your eye for detail and beauty is amazing! The head table was a knockout. Again, hats off to you and your team. I must add that your finished product is second to none. An update on our couple………. Since this article posted~ on 10.29.12 Seyi Ajirotutu was signed to The San Diego Chargers as a Wide Receiver!!! Congratulations!!! Seyi & Autumn now reside in sunny San Diego! Go Chargers!!!! Officiant: Uncle Olu Ajirotutu presided over the wedding ceremony services.